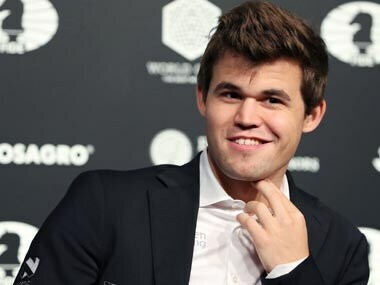 In the final three rounds of the FIDE World Team Chess Championship, the Indian contingent fought hard to make a podium finish, but fell short by a mere whit. In both the Open and the Women’s section, the team finished fourth. 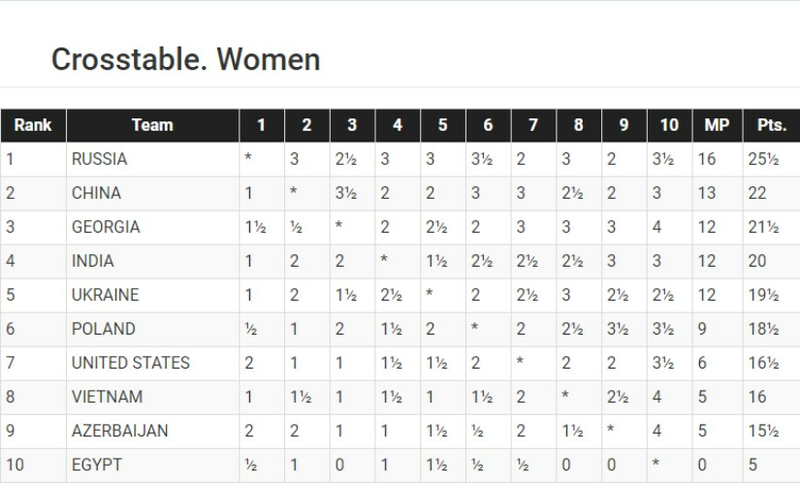 While hopes in the Open section had already evanesced after the penultimate round, the Women’s team had an outside chance of finishing with a medal depending on the results of some other matches of the final round. 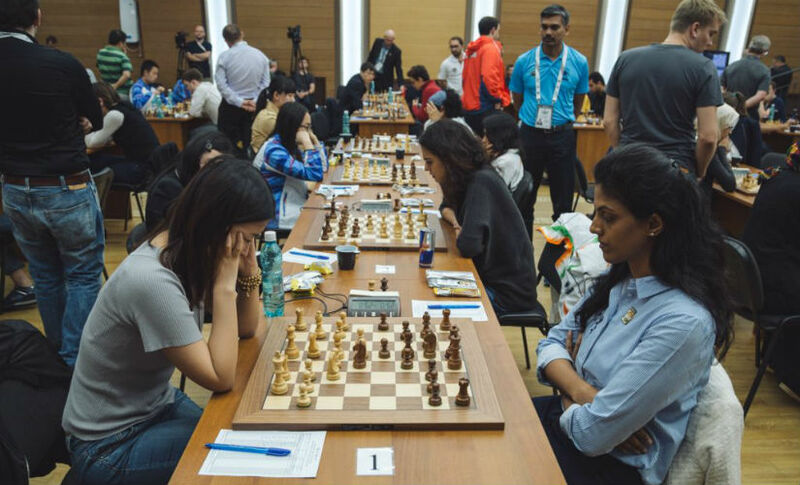 In Round 7, the Indian team was to face third seed Ukraine in the open section while the women’s team had to cross swords with the top seed China. 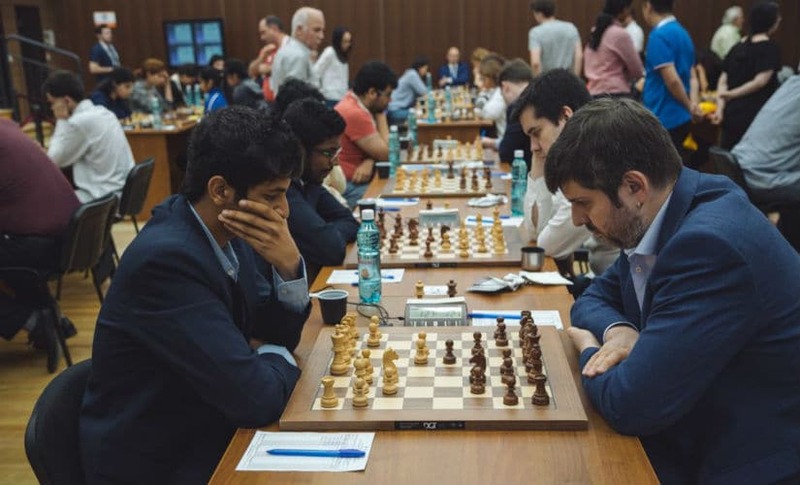 The first game to finish in the India-Ukraine match was the game between Alexander Areshchenko and Krishnan Sasikiran. The latter opted for the ultra-sharp Marshall Gambit to counter the Ukrainian’s king’s pawn opening. But Areshchenko seemed to be well-prepared for the line. Giving up his extra pawn at the right moment, the Ukrainian Grand Master was able to exchange queens right out of the opening. This was followed up by an exchange of rooks and the resulting position was a dull endgame with barely any chances for either side. The players agreed a draw after just 26 moves. Parimarjan Negi had the white pieces against Alexander Moiseenko on board four. The game started as an unorthodox Sicilian in which the Indian Grand Master deviated from mainline theory on move 3, and went his own way. He further went on to sacrifice a pawn on the 15th move, but was unable to create much chances. Pieces were exchanged at timely intervals and for while it seemed that the game might end peacefully, Moiseenko complicated matters by sacrificing a piece for creating a passed pawn on the queen’s file. Negi, with his extra piece, however, never really let his position go out of hand and the players agreed to broker peace after forty-four moves. In the top-board encounter between the former FIDE World Champion, Ruslan Ponomariov, and Vidit Gujrathi, the former pressed hard with the white pieces to get the better of the Indian number three. The game began as a Rossolimo Sicilian in which Gujrathi had no troubles neutralizing. The Ukrainian, however, had a space advantage and tried capitalizing upon it in the endgame. When things didn’t seem to go the way he wanted them to, Ponomariov sacrificed his knight for two of Vidit’s pawns and tried to create chances. But this just looked like a vain attempt to draw blood out of stone as there wasn’t enough material remaining on the board. Gujrathi gave up his final pawn in order to stop the advance of Ponomariov’s advancing pawns and the Ukrainian had nothing better than accepting a draw on the 95th move. 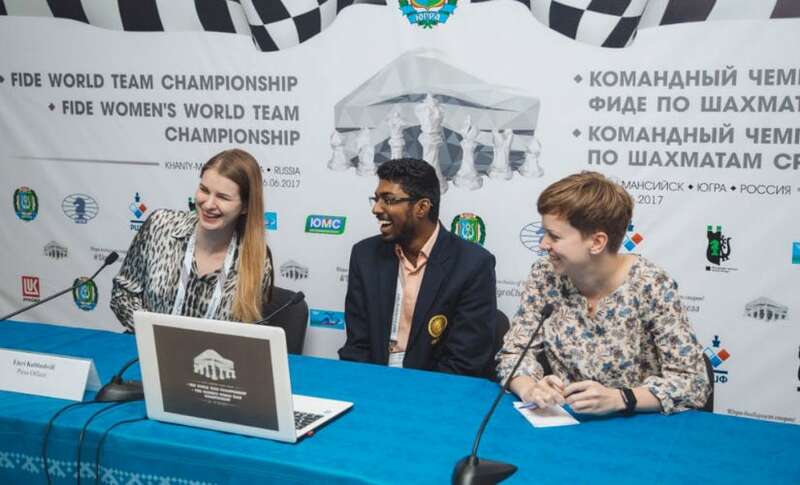 With three draws on three boards, the game between Adhiban Baskaran and Anton Korobov was the one to decide the result of the match. Playing with the white pieces, Baskaran countered Korobov’s French Defence with 3. Nc3, the sharpest variation against the French. Things turned even sharper as players castled on opposite wings. Korobov tried to calm matters by exchanging queens. The resulting position looked promising at the outset for the Ukrainian as he was able to plant his bishop deep into Baskaran’s position. But the Indian showed his flair by coming up with a neat manoeuvre with his king and knight to show that the Ukrainian had no good plans to make progress, and his deep-penetrated bishop was only a mirage. By the 34th move, Adhiban was in a clear position to win, and was able to force his opponent’s resignation. With this win, the Indians had moved up to the fourth spot on the leaderboard and had good chances to clinch a medal. The women, who were playing against China in the seventh round, also did a fantastic job of holding their opponents to a draw. On the top board, Harika Dronavalli had no problems equalising against Ju Wenjun with the black pieces. The game began as a Queen’s Gambit Declined and ended in a draw after 31 moves. 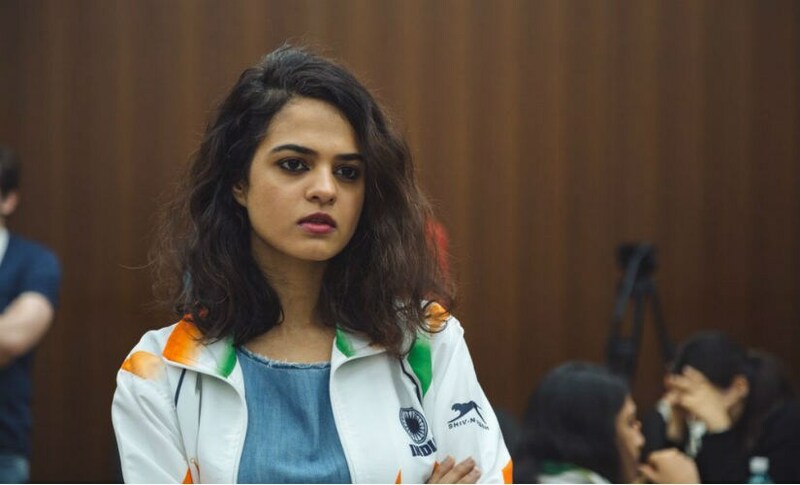 Tania Sachdev, who was playing with the white pieces against the reigning Women’s World Champion, Tan Zhongyi, also pulled off an easy draw in merely 24 moves of a Queen’s Indian Defence. On the third board, however, Eesha Karvade was outplayed by Tingjie Lei in a Semi-Slav, and was forced to resign after 49 moves. The onus of keeping India’s chances alive in the tournament was on Padmini Rout now. Playing against Qi Guo, Padmini had an equal position out of a Caro-Kann Defence. But Rout came up with an excellent idea on her 43rd move that looked anti-positional on the outset but won her a pawn eventually. With an extra pawn in a knight endgame, Rout was able to race her king rook pawn up the board and after 61 moves, Guo Qi was on her knees. Round 8 was an extremely tough one for the Indians in the open section as they faced the second seeded Russia. All Russian players were rated higher than their Indian opponents. But as the round began, things looked rather good for the Indians. Gujrathi was in a position of command against world No 14 Peter Svidler. Starting out with the Fianchetto Variation of the King’s Indian Defence, Gujrathi was able to squeeze an advantage in a seemingly equal middle-game. By the 19th move he even had an extra pawn. Around move 45, Gujrathi seemed as if he was cruising towards victory. But the seven-time Russian champion decided to fight on. Hypnotized by the complications, Gujrathi missed a clear win on move 51 and had to settle for a draw by move 65. On board two, Baskaran played a fairly balanced game with the black pieces against Ian Nepomniachtchi and was able to hold a draw in 39 moves of an English Opening. On the third board, Sasikiran’s opponent, Maxim Matlakov blundered a pawn early in the opening and gave Sasi the advantage. As play progressed, Matlakov was able to infiltrate with his rook into Sasikiran’s position and the Indian was only able to draw the game. On the last board, Negi was able to secure a pleasant advantage from the black side of an Italian Opening by the 37th move. But on move 43, the Indian Grand Master misjudged a tactical sequence and gave away his advantage. Making the most of his opponent’s inaccuracy, Fedoseev lunged forward with his king and was able to win a pawn on the 59th move. With a far advanced extra pawn, converting the position was just a matter of technique for the Russian. This was Negi’s first loss in the tournament, which not only decided the match in Russia’s favour, but also ended India’s chances of a podium finish in the tournament. While India lost to Russia in the Open section, the women’s team gave the Indian fans a reason to cheer by defeating Vietnam with a 2.5-1.5 margin. But the games in the Women’s section too were extremely tumultuous. On the top board, Dronavalli started off with a king’s pawn opening against Le Thao Nguyen Pham. The game was pretty equal until the endgame when Dronavalli blundered and was in a dead-lost position. The fact that she was able to save the game is nothing short of a miracle. Playing two pawns down in an endgame, Dronavalli had a knight and no pawns against Pham’s bishop and two pawns. The Vietnamese International Master was cruising towards victory, advancing her pawns when she blundered on the 76th move and allowed Dronavalli’s knight to enter the position and sacrifice itself for her ‘c’ pawn. In the resulting position, Pham was left with a light-squared bishop whereas her rook pawn was going to queen on a dark square. This meant that her bishop would not be able to stop Dronavalli’s king from blockading the pawn on its destination square. Because of this, the position was a theoretical draw. On board two, the situation was quite the opposite of what it was on board one. Sachdev had a dominating position in the middle-game against Thi Bao Tram Hoang. She was even able to win her opponent’s knight without any compensation to her opponent by move 46. But unfortunately, she messed up the position in the next phase of the game and had to split the point after 79 moves of play. On board three, Rout also had a better position against Thi Mai Hung Nguyen. But she too wasn’t able to convert and had to agree to a draw after 42 moves. With three out of the four games drawn, the third board encounter between Eesha Karavade and Thi Kim Phung Vo was to decide whether or not India will have any chances to win a medal in the final round. Playing on the white side of a King’s Indian Defence, Karavade marched her king forward in the endgame and was able to pick up several of her opponents pawns. As the game progressed, Karavade started advancing her extra pawns and Vo had to sacrifice her bishop to stop them. With an extra piece to the good, converting the game was no problem for Karvaade. With her win, India maintained its chances of a podium finish in the women’s section, however difficult it was for them. 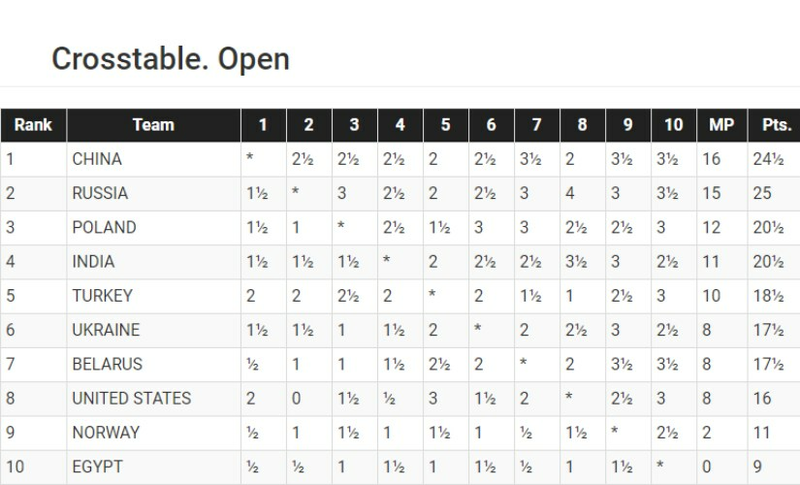 For India to win, Ukraine (who had more match points than India) would need to lose to Russia and Georgia would need to either draw or lose against USA in the final round. Besides, India would also need to win against Azerbaijan with a minimum difference of three points, i.e. with a score of 3.5-0.5 or 4-0. A slim one, but a chance nevertheless. Going into the final round, team India had no chances of a podium finish in the open section. Despite this, the team played vigorously and defeated Norway with a score of 3-1. On board 1, Gujrathi audaciously sacrificed a piece out of the opening against Aryan Tari. As compensation, Gujrathi had an attack against his opponent’s king. The computers, however, were not very impressed by this sacrifice. Tari too defended his position to the best of his ability at one point, and even obtained a better position. But concerned about the safety of his king, Tari sought to liquidate the position. In the ensuing endgame, it technically turned out to be a draw despite an extra pawn in Gujrathi's disposal. The players agreed a draw after 56 moves. On board 2, Baskaran outclassed his opponent, Johan Salomon, from the white side of an English Opening. 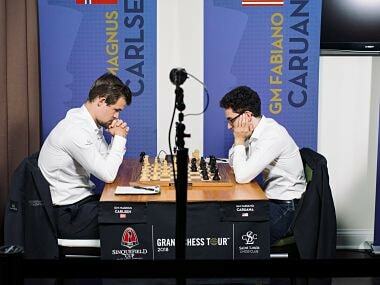 He was able to get an advantage after his opponent erred early in the middle-game. As play progressed, the Indian never really let his advantage slip out and converted the game smoothly in 39 moves. On board 3, Karthikeyan Murali also won his game after his opponent, Frode Elsness, played an incorrect exchange sacrifice on move 16. As play proceeded, Karthikeyan was able to exchange pieces and keep his material advantage until the endgame. By the 38th move, Elsness was already an exchange and a pawn down and was about to lose a second pawn. Seeing no hope, the Norwegian International Master resigned on the 38th move. The fourth board encounter between Sasikiran and Lars Oskar Hauge was a bit of an upset for the Indian Grand Master. Playing with the white pieces, Sasi was able to get an advantage early in the game. Once he had the advantage, Sasi played enterprisingly and sacrificed an exchange on move 19, exploiting the better placement of his bishops. As play proceeded, Hauge returned the exchange in order to trade more pieces. In the resulting rook and pawn endgame, Sasi had an extra pawn but the position was a theoretical draw and after trying for a few moves, Sasi decided to repeat the position and call it a day. The Women’s team almost had their dream come true in the final round when Russia beat Ukraine with a score of 2.5-1.5. This meant that one of their competitors was out of their way. The Indians had made one major change in the team for the final round. 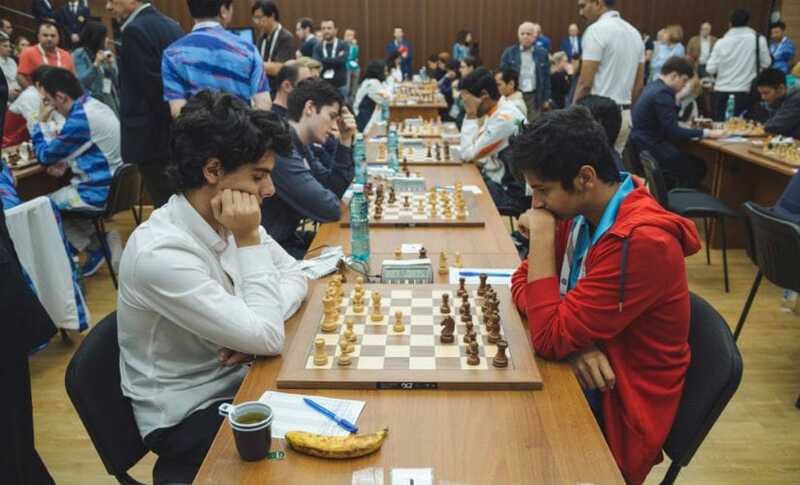 Dronavalli , the highest-rated player in the team, had been rested and Sachdev was to play on the top board. On the second board, Karavade had the white pieces against Gulnar Mammadova. The latter countered Karvade’s 1. e4 with the French Defence. Karvade seemed to have a surprise ready for her Azeri opponent in the form of the Schlechter Variation, a line which is rarely seen in high-level chess. Although there weren’t any fireworks in the opening or the middle-game, Karavade was able to obtain an edge in the endgame which she went on to convert and won in 60 moves. On the third board, Rout daringly captured a pawn against Ulviyya Fataliyeva which opened lines towards her king. In order to break through, the Azeri Woman International Master sacrificed a piece. But Rout had things under control as she marched her king into safety on the queenside. A few moves later, the Indian was also able to exchange queens and was out of any danger whatsoever. Once the queens were exchanged, Fataliyeva was simply a piece down, without any compensation, and decided to resign after 45 moves. On the last board, Vijayalakshmi Subbaraman had a very equal game against Khanim Balajayeva until very late in the endgame. But one small advantage that Subbaraman had in the endgame was that of having a bishop pair against her opponent’s bishop and knight. Maneuvering her pieces carefully, she was able to build up a strong position and eventually her bishop pair dominated. To finish things off, the Indian International Master raced her queenside pawns up the board while her opponent’s pieces were tied down by her bishops. By the 49th move, Balajayeva realized that Subbaraman’s pawns were unstoppable and was forced to resign. 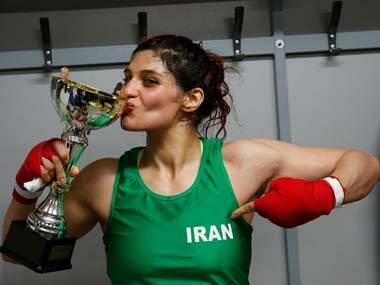 With three wins out of the four games, all that was required now was Sachdev drawing her game against Gunay Mammadzada. That aside from Georgia being held by the USA to a draw at the very least, for the Indian women to win the bronze. Unfortunately, none of the two happened. While Georgia thrashed the American women’s team with a 3-1 victory, Sachdev lost her game against Mammadzada. And even if Sachdev had drawn or won, India would still have finished fourth since Georgia had more game points than them. So, after nine grueling rounds, India finished fourth in both the Open and the Women’s section. Aditya Pai is an editor for ChessBase India.